ShortScale :: View topic - At last, a cheap alternative to the Warmoth bridge. At last, a cheap alternative to the Warmoth bridge. Posted: Fri Sep 04, 2015 7:20 pm Post subject: At last, a cheap alternative to the Warmoth bridge. I have a pile of 8mm and 6mm M3 screws. They seem to work well. The other interesting thing is the mounting cups that come with these bridges. They're tighter than your standard Mustang/Jazz/Jag bridge cups and are more like the MIM Jazz/Jag cups that grip the bridge more tightly so you can put a standard Jazz/Jag/Mustang bridge in there without any tape around the posts and they will always be centered. Using tighter posts, the bridge will still rock a little bit under vibrato use, but seem to come back to the same spot a lot better than the standard design. 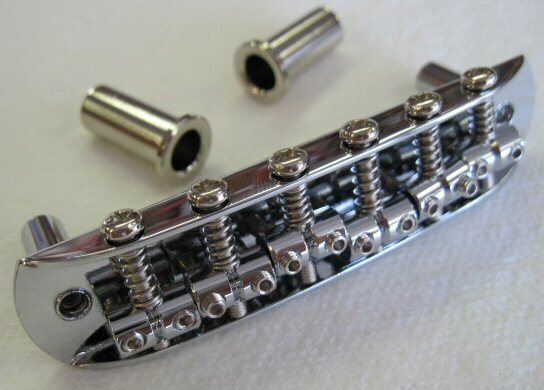 However, they're not a direct retrofit to the vintage style mounting cups, so I don't suggest fitting them to a valued instrument unless you have a really good reason to. They're cheap bridges, sure, so don't expect them to replace a Staytrem, but they sure work great. And saddles have no gaps, either. All in all, the posts and the bridge combination reminds me a lot of Blacktop Jazzmaster bridges. GraphTech saddles, huh. I tried some of those saddles for my friend's Blacktop Jazz. They worked out very nicely on that guitar. I think this is the same as the MIM Blacktop and Squier VM bridge.